By 2008, the Spanish government was borrowing at a rate of nearly 5%,20 and businesses were hard pressed to find financing at any rate. The future of Spain was uncertain as investors and business owners questioned whether Spain would stay in the Eurozone. Hiring and credit markets froze; unemployment rose to 20% in 2010 from 8% in 200821 and loans over €1 million to companies dropped 25% from 2009 to 201022, as companies awaited a response from the Spanish government. Yet, then Prime Minister José Luis Rodríguez Zapatero was slow to institute any significant reforms. The socialist leader had political pressure from the left to uphold government services and labor-friendly labor laws. 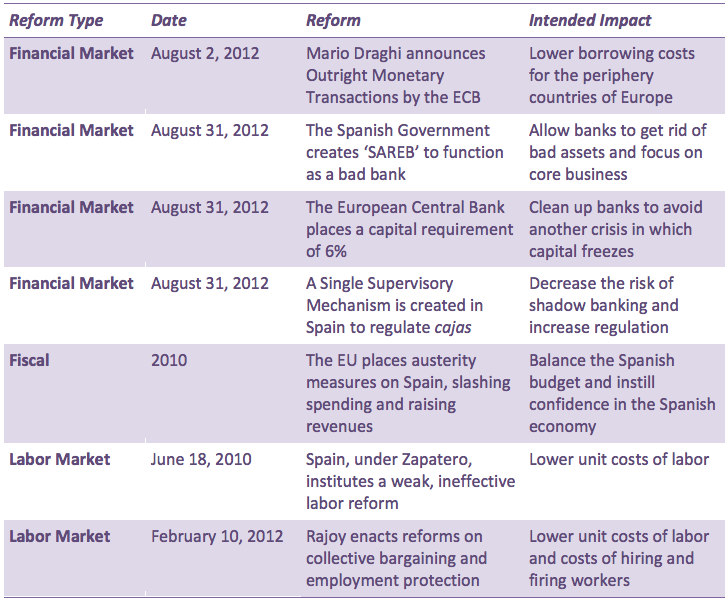 The reforms that the Rajoy government enacted in response to the crisis, highlighted in Table 1, can be placed into three main categories: financial market reforms, fiscal measures and labor market reforms. Each reform was put into place to stabilize the macroeconomy of Spain and to allow for the return to capital markets for both the government and businesses. The Spanish economy needed a renewed sense of credibility within global markets, and the reform effort was aimed at reinstating this credibility to put Spain on the road to recovery. To restore confidence in the periphery: countries like Spain, Portugal, Ireland and Greece outside the core of Europe, on August 2, 2012 the European Central Bank's president Mario Draghi announced that the ECB was prepared to undertake Outright Monetary Transactions (OMT) to aid ailing countries, and that Spain would be granted up to €100 billion to salvage its banking system.24 The ECB recognized that the system that had allowed for the origination of millions of mortgages in Spain, many of which were to subprime borrowers with little equity to back up the loans, needed to be changed. In exchange for the ECB's pledge of support, Spain was required to administer certain reforms in its financial system. The next task was to better capitalize Spain's functioning banks. Many banks, with low amounts of capital in the first place, had yet to write off all of the underperforming loans due to the housing crisis. In order to avoid another crisis of the same scale, and instill confidence in the banking system, the European Union ordered banks to raise their capital levels in line with the European Central Bank stress tests of 6% of assets.27 Banks receiving state aid were required to shed their riskiest assets to comply with risk-weighted capital requirements. Each of these reforms attempted to restore the banks' access to funding markets, to allow for banks to start lending to businesses once more and, eventually, to propel the economy forward. To combat the fiscal problems, Spain has gone through two distinct phases: an expansive phase from 2008-2009 and a consolidation phase from 2010 to the present day. Both phases came at the recommendation of the European Union, and have produced significant effects on the fiscal situation of Spain. Another important aspect of Spain's fiscal landscape is the presence of autonomous regions, roughly equivalent to states in the United States. The regions, through health care, education and social services, outlay 35% of total government expenditures in Spain, yet bring in only 19% of total revenues in taxes. The deficits are filled in by transfers from the central government, contributing to 56% of the deficit in 2009. As domestic demand in Spain decreased due to the housing crisis and subsequent employment crisis, Spain needed to become more competitive in the global market place. Most countries would use their central banks to lower interest rates and devalue their currencies, yet this option was not available to Spain because of its participation in the Eurozone. The other option to increase competitiveness globally was to decrease unit labor costs, which would in turn allow Spanish exporters to reduce their prices. Spain was renowned for its archaic labor laws, as companies found it difficult to fire employees, employees enjoyed early retirement with full pensions, powerful collective bargaining positions, and, most importantly, constant wage increases. While its GDP (-7%) and employment (from 9% to 20% unemployment) levels fell precipitously in the three years beginning in 2008, Spain's unit labor costs actually increased by an average of 1.7% a year.35 Spain began to address these issues with a labor reform in 2010, but it wasn't until February 10, 2012 with the Royal Decree Law 3/201236, that Rajoy was able to enact a monumental labor reform. The 2012 labor reform consisted of two main initiatives: reforming the collective bargaining aspect of Spanish labor and adjusting the employment protection legislation. The reforms attempted to hit the heart of the matter; Spain needed to reduce its labor costs and had to wrest power from its employees. The first step was to give priority to collective bargaining agreements (CBA) at the firm level over those established at the sector or regional levels. This allowed for Spanish firms to become more competitive amongst each other, and made it easier to decrease wages without strikes. The new CBA reforms allowed for firms to opt out of an agreement and implement "internal flexibility," meaning firms could introduce unilateral working condition changes for economic or productivity reasons. For example, Spanish firms were now able to change the wages and working hours of employees in order to increase profits, a practice that was unheard of before 2012. In addition, in the absence of an agreement of internal flexibility, an employer could refer the matter to a relatively speedy arbitration rather than go through a full review by labor courts, allowing changes to a company's workforce to go through more quickly without high costs for litigation. "Austerity Measures in Crisis Countries - Results and Impact on Mid-term Development. "Intereconomics(): 21-26. Print. Bartha, Emese. "Bonds of Italy, Spain Narrow Gap with U.S., German Yields." The Wall Street Journal. N.p., 8 Apr. 2014. Web. .
"Can Francois do a Gerhard?. "The Economist. N.p., 11 Jan. 2014. Web. .
Candel, Maria Teresa. "Spain passes major labour law amendments."Lexology. N.p., 2 Apr. 2012. Web. .
Chislett, William. "What does the economic future hold for Spain?." N.p., 25 Mar. 2014. Web. .
"Current Account Balance. "The World Bank. N.p., n.d. Web. .
Dinmore, Guy. "Italy's Matteo Renzi pledges tax cuts and labour reforms. "Financial Times. N.p., 12 Mar. 2014. Web. <"Can Francois do a Gerhard?." The Economist. N.p., 11 Jan. 2014. Web..>. "EU austerity drive country by country."BBC. N.p., 21 May 2012. Web. .
Etxezarreta, Miren. "Boom and (deep) crisis in the Spanish economy: the role of the EU in its evolution.." N.p., 1 Sept. 2011. Web. .
"Financial Assistance Programme for the recapitalisation of Financial Institutions in Spain." European Commission, 1 Jan. 2014. Web. .
Galloni, Alessandra. "Messy Italian Election Shakes World Markets. "The Wall Street Journal. N.p., 26 Feb. 2013. Web. .
Glazer, Emily. "Investors Breathe Life into European Banks' Bad Loans." The Wall Street Journal. N.p., 30 Mar. 2014. Web. .
Hofstede, Geert. "Spain. "The Hofstede Centre. N.p., n.d. Web. .
"IMF World Economic Outlook. "International Monetary Fund. N.p., 1 Jan. 2014. Web. .
"Indices de opinion publica. "Simple Logica. N.p., n.d. Web. .
"Informe mensual de comercio exterior. "Ministerio de economia y competitividad. N.p., 1 Jan. 2014. Web. .
Karaian, Jason. "Spanish real estate has lost more than a third of its value, but it's still overvalued."Quartz. N.p., 13 Sept. 2013. Web. .
"Labour Compensation per Employee."OECD. Web. .
Lafraya, Conchi. "Las contradicciones del credito. "La Vanguardia7 Apr. 2014: n. pag. Print. "Ley 26/2013, de 27 de diciembre, de cajas de ahorros y fundaciones bancarias." Boletín Oficial del Estado. N.p., 28 Dec. 2013. Web. .
Mars, Amanda. "Mitos del 'boom' emprendedor." El Pais, 6 Nov. 2013. Web. Minder, Raphael. "Mix of Politics and Banking in Spain's Woes." 3 June 2010. Web. .
Moffett, Matt. "Export Prowess Lifts Spain From Recession." The Wall Street Journal. 30 Oct. 2013. Web. .
Operé, Fernando, and Carrie B. Douglass.España y los españoles de hoy: historia, sociedad y cultura. Upper Saddle River, N.J.: Pearson Education/Prentice Hall, 2007. Print. Pallares, Ignacio. "Royal Decree Law 24/2012 address restructuring and termination of Spanish credit entities."Lexology. N.p., 24 Sept. 2012. Web. .
Patnaude, Art. "Spain Launches $9.6 billion Property-Loan Sale." The Wall Street Journal. N.p., 16 Apr. 2014. Web. .
"Posición de inversión Internacional de España." Banco de España. N.p., n.d. Web. .
"Presupuesto Generales de las Comunidades Aútonomas." Ministeria de Hacienda y Administraciones Públicas. N.p., 1 Jan. 2013. Web. .
"Private debt in % of GDP."Eurostat. N.p., n.d. Web. .
Randow, Jana. "ECB Said to Consider Minus 0.1 Percent Deposit Rate." Bloomberg. N.p., 20 Nov. 2013. Web. .
Roman, David . "Madrid Austerity Plan Boosted to $80 Billion. "The Wall Street Journal. N.p., 12 July 2012. Web. .
Rooney, Ben. "Spain’s Financial Crisis a Boost to its Startup Economy."WSJ. N.p., 17 Oct. 2013. Web. .
"Royal Decree-Law 3/2012 of urgent measures to reform the employment market. "Herbert Smith. N.p., n.d. Web. 1 Feb. 2012. .
"Savings and Groans." The Economist, 19 Nov. 2009. Web. .
"Spain Government Bond 10Y." Trading Economics, n.d. Web. .
"Spain: Financial Sector Reform - Fourth Progress Report." International Monetary Fund, 1 Nov. 2013. Web. .
"Stability Programme Update." The Spanish Economy. N.p., 1 Jan. 2013. Web. .center/interest-rates/Pages/TextView.aspx?data=yield>. "Technical features of Outright Monetary Transactions. "European Central Bank. N.p., 6 Sept. 2012. Web. .
"The 2012 Labour Market Reform in Spain: A Preliminary Assessment."OECD. N.p., 1 Dec. 2013. Web. .
"The adjustment of the Spanish Real Estate Sector." Ministerio de Fomento, 1 Jan. 2012. Web. .
"The Residential Investment Adjustment in Spain: The Current Situation." Banco de España, 20 Dec. 2010. Web. .
"The Spanish Government imposes an €8 billion budget adjustment on the Autonomous Communities in 2014 and 2015. "Catalan News Agency. N.p., 17 Oct. 2013. Web. .
Tremlett, Giles. "Spanish election: convincing victory for People's party. "The Guardian20 Nov. 2011: n. pag. Print. Tremlett, Giles.Ghosts of Spain: travels through Spain and its silent past. New York: Walker & Co. 2007. Print. "Unit Labour Costs - Annual Indicators."OECD. N.p., n.d. Web. .
U.S. Department of the Treasury. N.p., n.d. Web. Xydias, Alexis. "Spain ETF Grows as Rajoy Attracts Record U.S. Investments." Bloomberg. N.p., 16 Apr. 2014. Web. .
Yahoo Finance. N.p., n.d. Web. . 1.) Tremlett, Giles.Ghosts of Spain: travels through Spain and its silent past. New York: Walker & Co. :, 2007. Print. 2.) Operé, Fernando, and Carrie B. Douglass.España y los españoles de hoy: historia, sociedad y cultura. Upper Saddle River, N.J.: Pearson Education/Prentice Hall, 2007. Print. 4.) Hofstede, Geert. "Spain. "The Hofstede Centre. N.p., n.d. Web. . 5.) Rooney, Ben. "Spain’s Financial Crisis a Boost to its Startup Economy."WSJ. N.p., 17 Oct. 2013. Web. . 6.) Mars, Amanda. "Mitos del 'boom' emprendedor." El Pais, 6 Nov. 2013. Web. 7.) "The adjustment of the Spanish Real Estate Sector." Ministerio de Fomento, 1 Jan. 2012. Web. . 8.) "Current Account Balance. "The World Bank. N.p., n.d. Web. . 9.) "The Residential Investment Adjustment in Spain: The Current Situation." Banco de España, 20 Dec. 2010. Web. . 10.) Chislett, William. "What does the economic future hold for Spain?." N.p., 25 Mar. 2014. Web. . 11.) "The Residential Investment Adjustment in Spain: The Current Situation." Banco de España, 20 Dec. 2010. Web. . 12.) Karaian, Jason. "Spanish real estate has lost more than a third of its value, but it's still overvalued."Quartz. N.p., 13 Sept. 2013. Web. . 13.) Etxezarreta, Miren. "Boom and (deep) crisis in the Spanish economy: the role of the EU in its evolution.." N.p., 1 Sept. 2011. Web. . 14.) "Spain Government Bond 10Y." Trading Economics. N.p., n.d. Web. . 15.) "Private debt in % of GDP."Eurostat. N.p., n.d. Web. . 16.) "Labour Compensation per Employee."OECD. N.p., n.d. Web. . 17.) Minder, Raphael. "Mix of Politics and Banking in Spain's Woes." N.p., 3 June 2010. Web. . 18.) "Savings and Groans." The Economist, 19 Nov. 2009. Web. . 20.) "Spain Government Bond 10Y." Trading Economics, n.d. Web. . 21.) "Spain Unemployment Rate." Trading Economics, n.d. Web. . 22.) Lafraya, Conchi. "Las contradicciones del credito. "La Vanguardia7 Apr. 2014: n. pag. Print. 23.) Tremlett, Giles. "Spanish election: convincing victory for People's party. "The Guardian20 Nov. 2011: n. pag. Print. 24.) "Technical features of Outright Monetary Transactions. "European Central Bank. N.p., 6 Sept. 2012. Web. . 25.) Pallares, Ignacio. "Royal Decree Law 24/2012 address restructuring and termination of Spanish credit entities."Lexology. N.p., 24 Sept. 2012. Web. . 26.) "Spain: Financial Sector Reform - Fourth Progress Report." International Monetary Fund, 1 Nov. 2013. Web. . 28.) "Financial Assistance Programme for the recapitalisation of Financial Institutions in Spain." European Commission, 1 Jan. 2014. Web. . 29.) "Austerity Measures in Crisis Countries - Results and Impact on Mid-term Development. "Intereconomics(): 21-26. Print. 31.) "EU austerity drive country by country."BBC. N.p., 21 May 2012. Web. . 32.) Roman, David . "Madrid Austerity Plan Boosted to $80 Billion. "The Wall Street Journal. N.p., 12 July 2012. Web. . 33.) "Austerity Measures in Crisis Countries - Results and Impact on Mid-term Development. "Intereconomics(): 21-26. Print. 34.) "The Spanish Government imposes an €8 billion budget adjustment on the Autonomous Communities in 2014 and 2015. "Catalan News Agency. N.p., 17 Oct. 2013. Web. . 35.) "Unit Labour Costs - Annual Indicators."OECD. N.p., n.d. Web. . 36.) "Royal Decree-Law 3/2012 of urgent measures to reform the employment market. "Herbert Smith. N.p., n.d. Web. 1 Feb. 2012. . 37.) Candel, Maria Teresa. "Spain passes major labour law amendments."Lexology. N.p., 2 Apr. 2012. Web. . 38.) "The 2012 Labour Market Reform in Spain: A Preliminary Assessment."OECD. N.p., 1 Dec. 2013. Web. . 39.) Moffett, Matt. "Export Prowess Lifts Spain From Recession." The Wall Street Journal. N.p., 30 Oct. 2013. Web. . 40.) Bartha, Emese. "Bonds of Italy, Spain Narrow Gap with U.S., German Yields." The Wall Street Journal. N.p., 8 Apr. 2014. Web. . 41.) Randow, Jana. "ECB Said to Consider Minus 0.1 Percent Deposit Rate." Bloomberg. N.p., 20 Nov. 2013. Web. . 42.) "Spain: Financial Sector Reform - Fourth Progress Report." International Monetary Fund, 1 Nov. 2013. Web. . 43.) Patnaude, Art. "Spain Launches $9.6 billion Property-Loan Sale." The Wall Street Journal. N.p., 16 Apr. 2014. Web. . 44.) "Spain: Financial Sector Reform - Fourth Progress Report." International Monetary Fund, 1 Nov. 2013. Web. . 45.) Glazer, Emily. "Investors Breathe Life Into European Banks' Bad Loans." The Wall Street Journal. N.p., 30 Mar. 2014. Web. . 46.) "Ley 26/2013, de 27 de diciembre, de cajas de ahorros y fundaciones bancarias." Boletín Oficial del Estado. N.p., 28 Dec. 2013. Web. . 47.) Glazer, Emily. "Investors Breathe Life into European Banks' Bad Loans." The Wall Street Journal. N.p., 30 Mar. 2014. Web. . 48.) Lafraya, Conchi. "Las contradicciones del credito. "La Vanguardia7 Apr. 2014: n. pag. Print. 49.) "Spain: Financial Sector Reform - Fourth Progress Report." International Monetary Fund, 1 Nov. 2013. Web. . 50.) Lafraya, Conchi. "Las contradicciones del credito. "La Vanguardia7 Apr. 2014: n. pag. Print. 51.) "Spain: Financial Sector Reform - Fourth Progress Report." International Monetary Fund, 1 Nov. 2013. Web. . 52.) "Stability Programme Update." The Spanish Economy. N.p., 1 Jan. 2013. Web. . 53.) "Presupuesto Generales de las Comunidades Aútonomas." Ministeria de Hacienda y Administraciones Públicas. N.p., 1 Jan. 2013. Web. . 54.) "The Spanish Government imposes an €8 billion budget adjustment on the Autonomous Communities in 2014 and 2015. "Catalan News Agency. N.p., 17 Oct. 2013. Web. . 55.) U.S. Department of the Treasury. N.p., n.d. Web. . 56.) Xydias, Alexis. "Spain ETF Grows as Rajoy Attracts Record U.S. Investments." Bloomberg. N.p., 16 Apr. 2014. Web. . 57.) "." Yahoo Finance. N.p., n.d. Web. . 58.) "Posición de inversión Internacional de España." Banco de España. N.p., n.d. Web. . 59.) "The 2012 Labour Market Reform in Spain: A Preliminary Assessment."OECD. N.p., 1 Dec. 2013. Web. . 62.) "Can Francois do a Gerhard?. "The Economist. N.p., 11 Jan. 2014. Web. . 63.) Galloni, Alessandra. "Messy Italian Election Shakes World Markets. "The Wall Street Journal. N.p., 26 Feb. 2013. Web. . 64.) "Indices de opinion publica. "Simple Logica. N.p., n.d. Web. . 65.) "Informe mensual de comercio exterior. "Ministerio de economia y competitividad. N.p., 1 Jan. 2014. Web. . 67.) "IMF World Economic Outlook. "International Monetary Fund. N.p., 1 Jan. 2014. Web. . 68.) "Can Francois do a Gerhard?. "The Economist. N.p., 11 Jan. 2014. Web. . 69.) Dinmore, Guy. "Italy's Matteo Renzi pledges tax cuts and labour reforms. "Financial Times. N.p., 12 Mar. 2014. Web. <"Can Francois do a Gerhard?." The Economist. N.p., 11 Jan. 2014. Web. David C. Wagner graduated in 2014 with a Bachelors degree in Finance from University of Virginia in Charlottesville, VA.